This ready reference is the first to collate the interdisciplinary knowledge from materials science, bioengineering and nanotechnology to give an in-depth overview of the topic. As such, it provides broad coverage of combinations between inorganic materials and such key biological structures as proteins, enzymes, DNA, or biopolymers. With its treatment of various application directions, including bioelectronic interfacing, tissue repair, porous membranes, sensors, nanocontainers, and DNA engineering, this is essential reading for materials engineers, medical researchers, catalytic chemists, biologists, and those working in the biotechnological and semiconductor industries. Eduardo Ruiz-Hitzky is the director of the Department of Porous Materials and Intercalation Compounds at the Materials Science Institute of Madrid (CSIC), Spain. His research work during the last 30 years has focused on organic-inorganic hybrids and bio-nanocomposite materials. 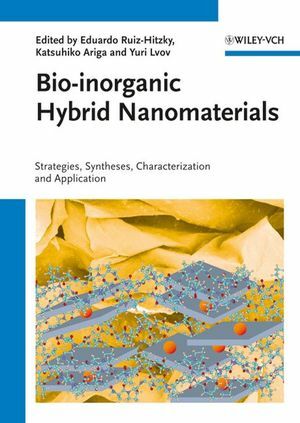 Professor Ruiz-Hitzky has authored over 150 scientific publications and edited two journal special issues, one of them (now in preparation) on bio-nanohybrid materials. He has received several scientific awards from different countries, including the AIPEA Medal from the International Association for the Study of Clays (Tokyo, 2005). Katsuhiko Ariga is the director of the Supermolecules Group at the National Institute for Materials Science (NIMS), Japan. His research work during the last 20 years has focused on fabrication of nanostructured materials through specific interaction at interfaces, creating novel hybrids of inorganic, organic and biological materials. Dr. Katsuhiko Ariga has authored over 230 scientific publications and received more than 3600 citations. He has published three text books on supramolecular chemistry and served as an editor of one book and one journal special issue on nanomaterials. Yuri M. Lvov is Chemistry Professor and Pipes Endowed Chair on Micro and Nanosystems at Louisiana Tech University, USA. Earlier, he worked in the Center for Biomolecular Science and Engineering at the Naval Research Laboratory. He is author of more than 150 scientific publications on ultrathin films, biomaterials, clay nanocomposites, and nanocapsules for sustained drug release. Professor Yuri Lvov was among the pioneers of the layer-by-layer nanoassembly technique based on alternate adsorption of oppositely charged components with more than 4000 citations of these works.